In the waning years of the nineteenth century, small Polish communities began to establish themselves across the region. Albion, Salamanca, and Batavia all drew Poles into their farming communities while in Lackawanna, North Tonawanda, and Niagara Falls industry called. In the village of Depew, the railroad would draw Poles to settle in the area. Pioneering Poles began to move into Depew before the village was incorporated in 1894. In April of that year Reverend Peter Basinski began to lay down the groundwork for a Roman Catholic Church to be established for the Poles. After two years of preparation, on February 2, 1896 SS. Peter & Paul’s Roman Catholic Church was formed. There were six families at the first Mass, but by the time the corner stone was laid for the red brick church on July 26, there were over 40. With much pomp and circumstance, the church was dedicated in 1898 and a school, convent, and rectory was soon added to the campus. Around the same time as Saints Peter and Paul was getting its footing, St. Joseph’s Independent Polish Catholic Church was being formed. The seeds of church were from the disaffiliation of the chosen site of SS. Peter and Paul on the north side of the railroad tracks. 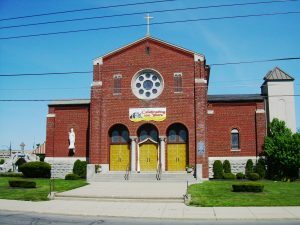 St. Joseph’s for a time would be located near the corner of Laverack and Muskingum and would even be visited by Bishop Anthony Kozlowski, a founder of the Independent Church movement. The congregation would dissolve by the early part of the twentieth century. In the end, the desire for a Polish church on the south side of the tracks would be fulfilled when St. Augustine’s Roman Catholic Church was opened in 1909. An outgrowth of SS. Peter and Paul, St Augustine’s would experience a tremendous increase in membership and would in time become more popular than its parent parish. Besides a church, school, convent, and rectory, St Augustine’s would purchase 34 acres of land in Lancaster for their own cemetery. 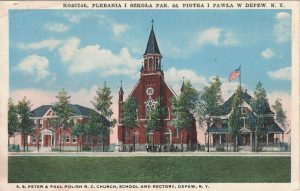 In addition to their religious organizations, the Poles of Depew worked to form social and cultural clubs. Two of the most influential Polish associations were the Depew Dom Polski also known as the Polish Depew Club and the Polish Falcon Society of Depew. Like other Polish Falcon groups, the Polish Falcon Society of Depew was an athletic-based organization. They would field a legendary baseball team, the Depew Falcons, which would take on the great clubs of Western New York including the Buffalo Colored Giants, the Hornell Eries, and the Niagara White Eagles. Organized in 1903 the Falcons purchased their first clubhouse at 45 Crane Street in 1919. The club has since moved off Crane and is now located at 445 Columbia. The Polish Depew Club started out at butcher Frank Rybak’s building at 85 Laverack Avenue. Composed of parishioners and organizations of St. Augustine’s Church, the organization raised enough money to open a clubhouse of their own. On October 3, 1926, near the intersection of Gould and Manitour, Father Tymek of St. Augustine’s laid the cornerstone for the Depew Dom Polski. The $50,000 building would include an auditorium, a reading room, club quarters, and in time a bowling alley. After a decline in member organizations, the building was sold to a private entity. 1896 1996 SS. Peter & Paul R.C. Church Depew, New York. Lancaster, NY: Delft Printers, 1996. Print. Cheektowaga Cavalcade: The First Hundred Years, 1839-1939. Buffalo: H. Wm. Pollack Poster Print, 1939. Print. "Cornerstone for Depew Dom Polski Is Laid." Buffalo Evening News [Buffalo, NY] 4 Oct. 1926: n. pag. Print. Diamond Jubilee 1909-1984 St. Augustine's Parish Depew N.Y. N.p. : n.p., 1984. Print. "Falcons Even Up Series with Colored Giants." The Depew Herald and Cheektowaga News [Cheektowaga, NY] 8 Sept. 1927: 6. Print. Domino, Arthur J., and Theresa L. Wolfe. Depew. N.p. : Arcadia, 2015. Print. Fronczak, Francis Eustace, Aleksander Pitass, and Mieczysław Haiman. "Ci, Którzy Do Pomogli Do Wydania Księgi Jubileuszowej Księga Pamiątkowa Złotego Jubileuszu Osady Polskiej I Parafji Św. Stanisława, B. I M. W Buffalo, New York, 1873-1923. [Buffalo, N.Y.]: Nakładem Komitetu Wydawniczego, 1923. Print. Holtz, Mary F. The Town of Cheektowaga Celebrates 150 Years: Cheektowaga Sesquicentennial, 1839-1989. Cheektowaga, N.Y.? : R.M. Moleski, 1989. Print. Jubilee Committee. Saint James Church Depew, New York 75 Diamond Jubilee 1897 1972. N.p. : n.p., 1972. Print. "Kaminski A Bishop." Buffalo Evening News [Buffalo, NY] 21 Mar. 1898: 1. Print. "Rybak Dies; Founder of Polish Club." Buffalo Courier-Express [Buffalo, NY] 5 Feb. 1961: 12. Print. Zloty Jubileusz Parafii Sw. App. Piotra I Pawla. Depew, NY: n.p., 1947. Print.